Due to the fact that card-not-present credit card transactions traditionally carry a higher potential for fraud, the credit card industry uses two tools to help E-Commerce merchants determine the legitimacy of any transaction. These tools are the Address Verification Service (AVS) and Card Verification Value (CVV2) codes. These codes are returned from the card issuing banks when an authorization is obtained. Navigate to Security Settings Fraud Screening. This is where you can change your filtering options for the transactions that you process. You can choose to reject transactions that are processed through the system based on various responses that come back from the bank processor. You can also choose to reject transactions based on the response that comes from the bank based on the CVV2 number the customer provided with their credit card. Click on the check box next to each response you would like to reject. 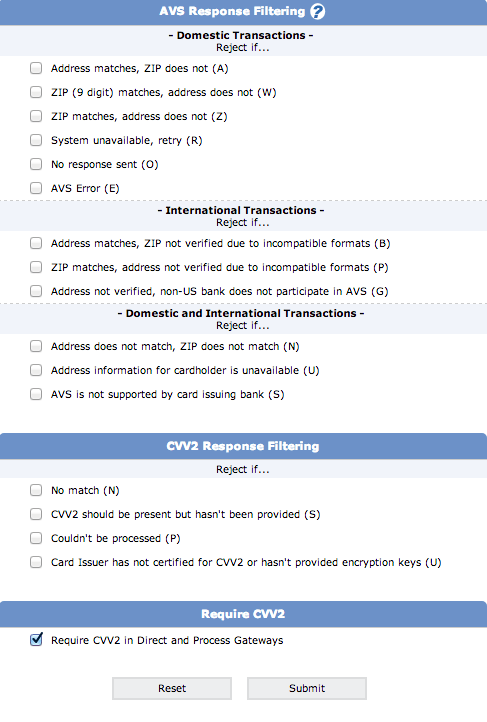 Recommended Minimum Settings: We recommend that you reject at least the N responses for both the AVS and CVV2 checks. Fraudulent transactions will frequently have an N response for either the AVS or CVV2 check, so by rejecting any sale where this value is returned will provide you some protection against fraudulent transactions. You may elect to reject other responses based upon your business's needs; merchants providing goods or services in higher-risk markets or selling high-ticket items may need to be more cautious and thus be more restrictive in their AVS and CVV2 settings. Click the Submit button at the bottom of the screen to save your changes. X: Both address and ZIP code match. AVS and CVV2 response codes are only sent by the card issuing bank when a charge is authorized. When the gateway receives the response from the card issuing bank, the AVS and CVV2 codes returned are checked against the codes you have elected to reject. If the AVS or CVV2 code matches a response you are rejecting, the gateway will fail the transaction and issue an immediate reversal. For further explanation of authorizations and how they affect the card balance, see authorizations vs. settlements.